The Stud began in 1978 with the purchase of Gerrig Dulais, a yearling filly by Hewid Cardi and out of Rhystyd Actress. We registered the stud prefix shortly afterwards, and began to slowly build the stud up to its present level. In the early years Dulais was joined by Tangarnfelen Mel, by Geler Cardi Model (out of a Hendy Brenin mare) and Abertawe Dorinda by Nebo Black Magic (out of a Llanarth Valiant's Image mare). Most of the early stock was based around Nebo Black Magic, Hendy Brenin and Pentre Eiddwen Comet blood lines, as indeed it still is. Although we stayed small to start with, we now try to keep around six to eight brood mares with their followers and two or three colts or stallions. Some of the colts are then gelded and subsequently run on for the performance market. Our first foal, born in 1981, (by Nebo Black Magic and out of Gerrig Dulais) was Rotherdale Actor. As a yearling at the South of England show 1982, he was awarded Reserve Cob Champion. At the 1986 N.P.S Mountain and Moorland W.H.P Championships at Malvern, ridden by Katie Harris, he stood fourth overall and was awarded best of breed. (See pg 25 of the W.P&C.S Journal 1987). Our next important purchase, in the Spring of 1982, was a 2 year old colt Gwrthafarn Commander, (by Twyford Druid and out of a Cippyn Red Flyer mare). Maturing to 15.hh Commander proved to be a brilliant sire of brood mares and competition horses in all disciplines, part-breds as well as purebreds.Two of our now senior brood mares are sired by him, and Carl Trock founded Danish Valhalla Stud on two more. Both of these mares have been junior and senior champions in Denmark, and are now breeding National champions themselves. Probably the most famous addition to the stud came in 1983 with the purchase of two year old filly Tydfil Magic Princess, from Abergavenny Market, the 'Princess Family' has been our most prolific stock line. With her and her daughter Rotherdale Magic Princess winning the Royal Welsh Show on four occasions each. Her offspring have proven to be valuable assets not only to ourselves, but other studs too, for both breeding and showing purposes. 'The Princess Story' is featured in the 1994 W.P&C.S Journal. Her most famous daughter is of course Rotherdale Magic Princess, who foaled in 1993 the same year that we retired her mother. They both won huge classes at that years' Royal Welsh, with Tydfil Magic Princess taking home the Gold Medal for Female Champion, and Overall Reserve Cob Champion. We try to breed a type of Cob that is useful for a variety of jobs, as well as looking beautiful. We like a long-striding free action, which allows the animal to cover the ground well, coupled with this we prefer a height range of 14.2hh to 15hh. From small and humble beginnings in the 1970's we have come a long way, but there is still so much more to achieve and learn. Our greatest honour to date came during the Society's Centenary celebrations at Builth Wells 2002, when after 25 years of breeding our efforts were rewarded with the Supreme Championship at the World Centenary Show. 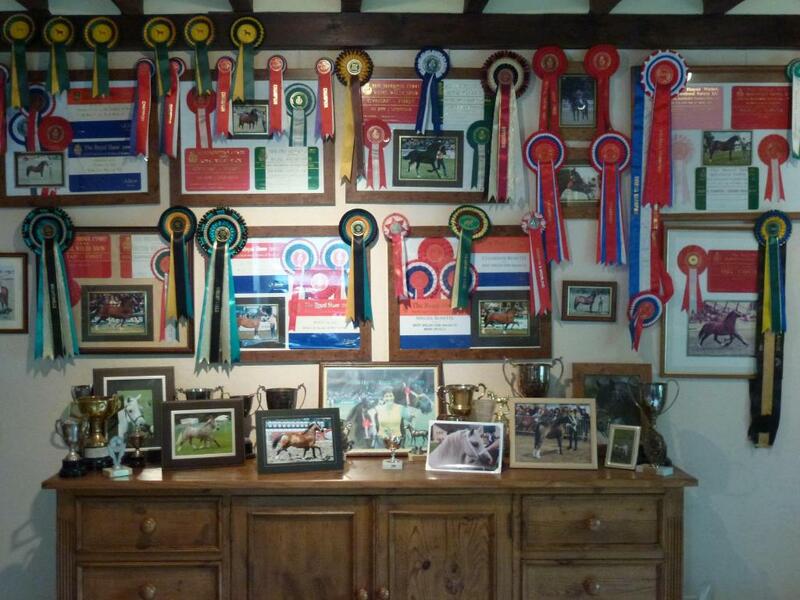 Many Rotherdale Cobs are being ridden and driven for pleasure, as well as succeeding in competition both at home and abroad, and we are alway honoured to recieve letters and phone calls from delighted new owners, with news of their successes. Additional information on animals can be found on the Stallions page and the Brood Mares Page.